The heroine Kamidaio's performance is cancelled! In an effort to make her sister's dream come true, Mikan approaches Ann in hopes of making a Kamidaio appearance happen. Misaki asks Mikan and Ann to become the action heroines of Hinano City! While they get acquainted with the other girls on the Heroine Team, another girl preps for her moment. Kanon demands to know why Ann quit the rhythmic gymnastics team. Unsatisfied with her answer, Kanon challenges An to a competition. Why is Kanon so determined to fight her? The action heroines are facing a possible infringement lawsuit, so they'll have to build original heroines from scratch. What concept will represent their small town best? Genki's twin sister Yuki is the singer Cheer Fruits needs, but Yuki's past as a failed idol has made her too paranoid to perform. Can they help her overcome her fears? A "Whimsical Angel" makes an appearance, or is she an "Explosion Angel?" The Cheer Fruits try to decide what to do with their newest excited interloper. 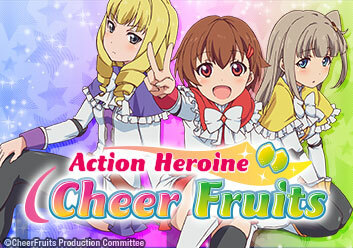 The Cheer Fruits' determination to save their town grows even stronger. Meanwhile, Mikan faces a challenge that may require more resolve than ever. Mikan is past her deadline to write new material, so she suggests a trip to beach for inspiration. However, is her place in the Cheer Fruits on the line? A dark memory hangs over Misaki as the girls prep for that night's special performance. When things go wrong on stage, a little improv may be required to save the show. As the girls practice to perform the newest show, lingering apprehensions loom in Misaki's mind. Things only get worse when Misaki suddenly disappears. The girls are preparing for their largest stage yet and Misaki is still nowhere to be seen. With so much on the line, they can't afford to make mistakes now.